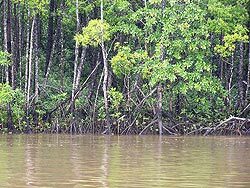 Mangroves are vascular plants, that is they have a well-developed system of conducting tissue to transport water, mineral salts and sugars. They are found in the intertidal zone where they are flooded by tides. Mangroves are plants that live between the sea and the land, where they are flooded by tides. This is called the intertidal zone. The word 'mangrove' is given to either an individual species or to a group of unrelated plants, living in areas that are flooded by tides. They grow as trees up to medium height and shrubs in saline (pure seawater (3% to 4%), to water concentrated by evaporation to over twice the salinity of ocean seawater (up to 9%). 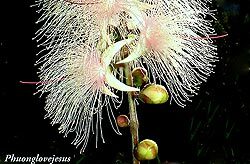 They grow in the tropics and subtropics – mainly between latitudes 25°N and 25°S in sheltered areas like estuaries, river banks and marine shorelines. They may also grow in protected temperate coastal areas. Australia has around 980,000 hectares of mangrove forests, which is less than 1% of Australia’s total forest cover. They grow in the soft mud between the half tide and the high tide mark. 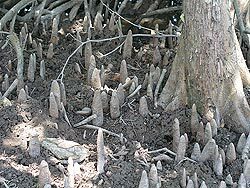 Part of the root system (pneumatophores) are always above the ground level and are able to take in oxygen during low tide as the soil they grow in does not contain any dissolved oxygen. They use salt water as a source of water for transpiration and exclude most of the salt from that water and excrete or store excess salt. They produce seeds which germinate on the trees before falling and floating until they start growing rapidly when they become anchored in the mud. Topics: mangroves (mangals), geomorphology, sea-level rise, progradation, global warming, climate change, ecology, coastal defence, cyclones. Location: Thomatis Creek, Barron River Delta (Cairns, Queensland, Australia). I would sincerely like to thank the many members of the Flickr community who have given me permission to use their wonderful images for this unit. Their contributions really make this unit come alive!